This tribute combined material chiefly from the obituary and the Moseley Wikipedia page entry, but has some unique personal details the author included from having known Jim. Editor’s note: Jim Moseley was one of my next door neighbors on Rose Lane (Rose Lane Villas) during the 1980’s. A self proclaimed grave digger who found and sold Peruvian artifacts, coupled with the fact that he was one of America’s top “UFOologists,” made him a fascinating character. I remember many a late night discussion with him on the subject of UFO’s. Sometimes a protagonist and sometimes a “debunker,” one never knew what to expect when talking about these matters with him. I remained an honorary subscriber to his “Saucer Smear” to the very end. It was always rather an enigma over the years that the Keys, with their beautiful expanse of nighttime sky and few ground lights, offered only about 6 UFO sightings since the early 1970’s. James Moseley, known as Jim, was born Aug. 4, 1931, in Brooklyn, N.Y. He was the only child of the famous Gen. Van Moseley and Florence Barber, one of the heirs of the Barber Steamship Lines of New York City. Jim loved travel most of all. His fondest memories were of his youthful days in Peru and the excavating of various Incan pottery and gold. He loved excitement, danger, and his then girlfriend Josephine, as well as Spanish culture and language. He returned to the U.S. to New York City and started Saucer News magazine after getting involved with the offbeat crowd in Greenwich Village. It was there that he met his wife, Sandra. He moved to Key West in 1983 with his girlfriend, Anna and her son, Patrick, and owned Rose Lane Gardens, a motel behind Fat Tuesdays, in downtown Key West. He had an antique gallery with some remaining antiques from Peru. He owned an apartment building, also on Duval Street. 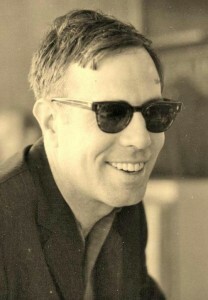 Jim was a Key West character who was an original. He made a lot of jokes about life, death, and the unknown. 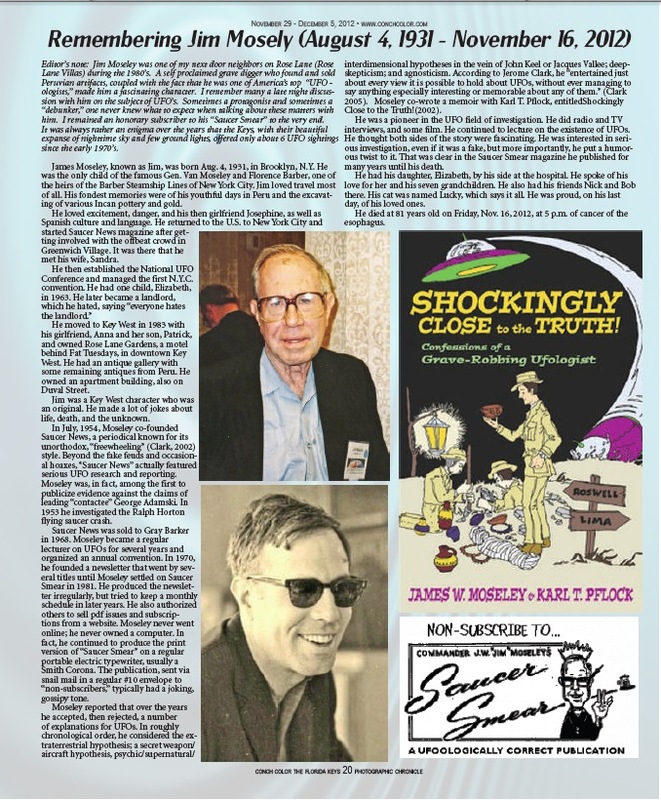 In July, 1954, Moseley co-founded Saucer News, a periodical known for its unorthodox, “freewheeling” (Clark, 2002) style. Beyond the fake feuds and occasional hoaxes, “Saucer News” actually featured serious UFO research and reporting. Moseley was, in fact, among the first to publicize evidence against the claims of leading “contactee” George Adamski. In 1953 he investigated the Ralph Horton flying saucer crash. Saucer News was sold to Gray Barker in 1968. Moseley became a regular lecturer on UFOs for several years and organized an annual convention. In 1970, he founded a newsletter that went by several titles until Moseley settled on Saucer Smear in 1981. He produced the newsletter irregularly, but tried to keep a monthly schedule in later years. He also authorized others to sell pdf issues and subscriptions from a website. Moseley never went online; he never owned a computer. In fact, he continued to produce the print version of “Saucer Smear” on a regular portable electric typewriter, usually a Smith Corona. The publication, sent via snail mail in a regular #10 envelope to “non-subscribers,” typically had a joking, gossipy tone. Moseley reported that over the years he accepted, then rejected, a number of explanations for UFOs. In roughly chronological order, he considered the extraterrestrial hypothesis; a secret weapon/aircraft hypothesis, psychic/supernatural/interdimensional hypotheses in the vein of John Keel or Jacques Vallee; deep skepticism; and agnosticism. According to Jerome Clark, he “entertained just about every view it is possible to hold about UFOs, without ever managing to say anything especially interesting or memorable about any of them.” (Clark 2005). Moseley co-wrote a memoir with Karl T. Pflock, entitled Shockingly Close to the Truth! (2002). He was a pioneer in the UFO field of investigation. He did radio and TV interviews, and some film. He continued to lecture on the existence of UFOs. He thought both sides of the story were fascinating. He was interested in serious investigation, even if it was a fake, but more importantly, he put a humorous twist to it. That was clear in the Saucer Smear magazine he published for many years until his death. He had his daughter, Elizabeth, by his side at the hospital. He spoke of his love for her and his seven grandchildren. He also had his friends Nick and Bob there. His cat was named Lucky, which says it all. He was proud, on his last day, of his loved ones. He died at 81 years old on Friday, Nov. 16, 2012, at 5 p.m. of cancer of the esophagus.